Perhaps steal is to big of a word for some, but the concept of learning from, borrowing from and gaining insight from the ideas, failures, successes, styles and approaches of others as a way to build something truly unique is a proven path to entrepreneurial success. So many entrepreneurs believe that success lies in some audacious innovation that is destined to revolutionize an entire industry. While that kind of result happens every now and then it’s actually more often a case where someone borrowed from many influences, learned how to make it there own and along the way accidentally tripped on an audacious innovation that changed the world. In this week’s episode of the Duct Tape Marketing Podcast I visit with Austin Kleon, author the book Steal Like An Artist and certainly the inspiration for the title of this post. Kleon’s book, subtitled 10 Things Nobody Told You About Being Creative, started out as a presentation given to a group of students and grew to be a bit of a movement. The book’s main premise is this: Creativity is in reality a form of “remixing.” According to Kleon creativity isn’t some flash of brilliance, but more of a collaborative process of combine existing ideas into innovative ones. To me that’s about as close to the definition of the art practiced by most entrepreneurs as I can summon. Note that the kind of stealing Kleon refers to is not the same as copying. Copying only allows you to create an inauthentic replica of something that already exists. The creativity that Kleon refers to is the kind that is inspired by others but becomes authentically your own. This practical, stylish, dare I say, hip book offers even more entrepreneurial advice and truths about creativity: Nothing is original, so embrace influence, collect ideas, and remix and re-imagine to discover your own path. Follow your interests wherever they take you. Stay smart, stay out of debt, and risk being boring—the creative you will need to make room to be wild and daring in your imagination. There you have it, go ahead and steal like an entrepreneur. By the way, check out Kleon’s first book too. 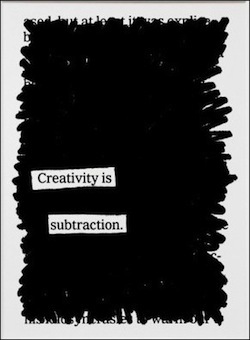 Newspaper Blackout is a book filled with art created by simply blacking out words in an article to come up with a creative saying. The image in this post is from the book.